Finished just before Christmas a testknit for a cardigan: the Riverside Cardigan from Gudrun Georges . I loved the simple, plain design, it’s a everyday vest without “chichi”, but has nevertheless an interesting detail once you look closer: the accentuate raglan decrease “seam” that continues into a side panel. The cardigan flowed from my needles without any problem. It’s a top down raglan construction, the only sewing needed is for the buttonbands, they’re worked separately and sewn on later. This ensures high more stability on one hand and on the other hand the cardigan looks beautiful from both sides and you can decide after finishing which side to use and sew on the buttonbands accordingly. I added 10 cm length. The cardigan is normally not too long which makes it perfect to wear with high-waisted pants and skirts. But as I don’t wear neither skirts nor high-waisted pants…. I knit the cardigan with no ease. Normally the cardigan is designed with about 8 to 10 inches of positive ease. I knit the cardigan in one of my favourite yarns: Yak from Lang. I find this wool stunning every time I use it. It’s not a fancy yarn for sure, I think you won’t fallen in love with it at first sight…but it’s my everyday, everywhere yarn. It’s one of the rare yarns I know that’s very soft yet doesn’t pill at all. And I mean really at all! I knit 3 pullovers and 3 cardigans in this yarn and don’t have even the slightest bit of piling. But mostly I love about the yarn the transformation once you’ve washed it! It’s a nice yarn to work with, but not veryy special…. but after washing it blooms a lot and becomes so lightweight! It’s simply stunning. I knit a knee-length cardigan with this yarn that weights nothing. It’s not fuzzy though, like mohair for example, simply light. And warm. And I loooooove this colour! If this is not my colour I don’t know which colour suites me better. PERFECT denim blue! Has to knit at least another pullover in this colour! 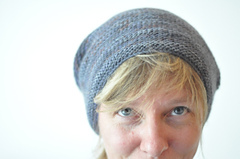 And thanks to dear Gudrun, she allowed me to share some photos from the original design here too! I think you can really see better this way the positive ease and the shorter length I mentioned above. Tu me donnes vraiment envie de tester cette laine !!!!!!!! Je viens de voir qu’elle existe aussi en tweedée 😍. Fait que je trouve d’abord un patron à faire avec… Mais je garde cette laine en tête ! !